One of the most striking of the striped succulent plants, Haworthia attenuate or Zebra haworthia can be a little confusing. Firstly it is a succulent and not a cactus. Secondly, at least 3 different plants get the same common name. To confuse things a little more, H. fasciata and H. attenuata are very similar plants, in fact they may be the same species according to some experts. This is a clump spring succulent from South Africa, and is widely grown inn containers as an indoor plant. Getting its common name of Zebra Cactus from the striped foliage, Haworthia attenuata is a great plant for growing indoors in containers. It is a low growing succulent reaching around 6 inches in height. It forms a clump and looks great in a terracotta container. This is a low growing plant, rarely reaching over 15 cm (6 inches) in height. Commonly grown as an indoor plant, this is a succulent that require good light to grow well. Strong filtered light is best with some direct sun in the morning being preferable. As the plant grows it forms rosettes of upright foliage. A mid to deep green with radial white stripes. As it is slow growing, it makes a great indoor plant and is reported to be non toxic to cats and dogs. 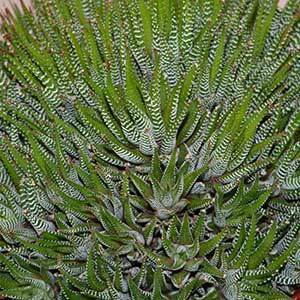 Haworthia attenuata will flower, small pink flowers in spring to summer. If you are lucky they may set seed which can be collected for propagation. The plant is regarded as non toxic to cats and dogs. This is just one of many garden worthy Haworthia species. Grown in a free draining specialist cactus and succulent mix, and given adequate light this is an easy care plant. Water every week or two when in active growth, from spring through summer. Always wait until the soil begins to dry a little before watering. Overwatering and cold drafts will cause problems. Fertilise in spring with a 50% strength application of a liquid fertiliser. Generally reaching around 20 cm in height (8 inches) often shorter indoors. The plant is regarded as being non toxic to both cats and dogs. Growing medium : Free draining. Spread : Clump forming over time. Leaves : Green with white stripes. Propagation : Easy from offsets. The easiest method of propagation is by division of larger clumps and this is best done in spring. It is also possible to propagate the Zebra plant from seed.